I first had a proper paella two years ago when on a minibreak to Barcelona with my other half. We ate at Puda Can Manel in Barceloneta and had to wait 2 hours to be seated. The place was clearly very popular with the locals, but it was worth the wait. Sat outside on a sunny but still slightly chilly Sunday in late January, we tucked in to a delicious Paella Marinera. Two years later, my other half and I were discussing what to do with the remaining fish in the fridge in France. It turned into salmon with red pepper and olive salsa, but the idea of making paella was firmly in my head, and with my uncle and aunt coming over for dinner, it seemed like the perfect excuse to make it. The photograph is, unfortunately, missing the ramiro peppers which I only remembered to add once it was too late. However, it is worth remembering them as they add a wonderful splash of colour! 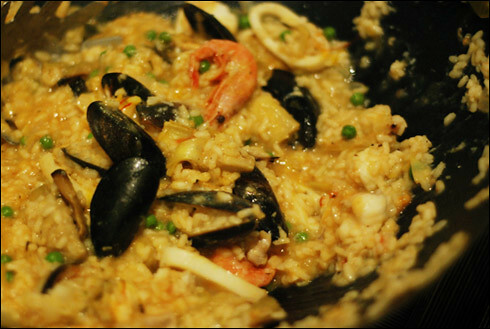 The making of paella is very similar to that of risotto. Use the biggest heavy bottomed pan you have - ideally about 15"/40cm. I don't have such a big pan so made do with my wok, to surprisingly good results. It helps to have all ingredients prepared in advance so you can add ingredients to the paella as you go with minimal extra hassle. I began by chargrilling, skinning and deseeding the peppers, then chopping them into 1.5cm strips. Then I plunged the tomatoes into boiling water for a minute and skinned and roughly chopped them. I also roughly chopped the artichoke hearts. From here it was onto the fish. You can use any firm white fish, but I chose to use a combination of cod and monkfish. Make sure the fish is both skinned and boned, then cut into 2cm dice and set aside. Then cut the squid tubes into 1.5cm rings. Clean the mussels: debeard them with a pair of scissors, discard any open ones that don't close when tapped and leave them in cool - not cold - water with a handful of flour to clean themselves for about half an hour or so. Now, onto assembling the paella itself. Finely chop the onion and gently fry in about a tablespoon of olive oil. Once soft, add the tomato, crush in the two cloves of garlic and stir in the paella rice. Cook for 2-3 minutes, add the saffron strands then cover with stock. When you have used about half the stock, add the peas, artichokes and ramiro pepper strips. Stir the monkfish, squid and cod into the rice, add another quarter of stock and simmer gently for 10 minutes. At this stage, add the paprika and season with salt and pepper to taste. Finally, stir in the prawns so they are covered and push the mussels opening end down into the paella. Add the very last of the stock and simmer for a further five minutes, until the mussels are open. Turn off the heat, stir all the ingredients together one last time, cover with a clean dishcloth and leave to stand for 10 minutes then serve. I paired this with a delicious bottle of white Rioja, which went with it beautifully! I made this last night (sans Rioja). I left out the mussels too as I'm still slightly scared to cook mussels but the recipe came together beautifully otherwise. Really nice, easy way of doing quality paella. :D Thanks! hurrah! if you're scared of using fresh mussels, just fling ready cooked ones in a couple of minutes before the end. that way you don't have to worry about de-bearding and making sure they're still alive too!